There is a huge variety of exciting career paths open to people with STEM based skills. In addition, almost every organisation today relies on people with STEM qualifications – including technology skills to run their IT systems and maths skills to manage their accounts: 72% of all UK businesses rely on people with STEM skills. 58% of all new jobs will be STEM related. There will be significant growth in new jobs but also massive replacement demand. Economically valuable skills such as STEM skills will matter most. Young people with STEM qualifications are in demand in the job market and have good long term career prospects. Choosing science, technology, engineering and maths subjects opens up options later in life. 59% of employers expect to find difficulty recruiting enough people with STEM qualifications in the next few years. STEM careers lead to good salaries later in life: Graduates earn £160,000 more than non-graduates in their working life time, and STEM graduates tend to earn nearly £250,000 more. Many large businesses offering STEM based apprenticeships pay for apprentices to go on to take a university degree – e.g. : in telecoms BT, in aerospace, in energy British Gas, in accountancy KPMG. People with STEM skills can make a big contribution to many of the big challenges facing society today. You could be developing crops which provide greater yield to farmers – in a world where one billion people don’t have enough food to eat. You could be designing safer cars – because almost 3,000 people a year are killed on UK roads alone. You could be working on a cure for cancer – because over 300,000 people are diagnosed with cancer each year in the UK. You could be creating educational software to help children with dyslexia – because 1 in 10 children suffer from some level of dyslexia in the UK. There is expected to be a 48% increase in demand for physical environmental science graduates in the next eight years. The UK government estimates that the renewable energy sector alone could create 500,000 jobs by 2020. The UK wind industry has the potential to create 60,000 new jobs over the course of the next 10 years – effectively expanding the current workforce in this sector tenfold. The Careers department believes that the promotion of STEM subjects is important for our economy. 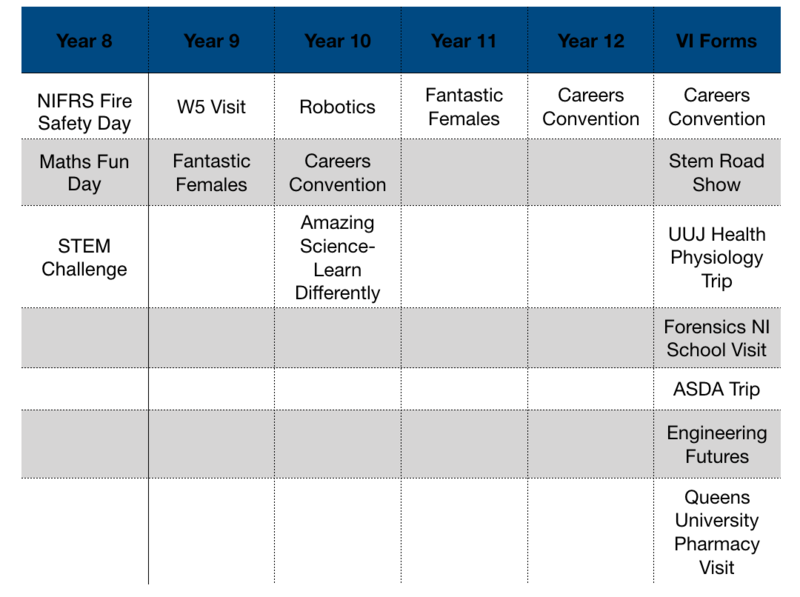 Ballyclare Secondary School have a fantastic range of STEM subject options at GCSE and Post 16 to suit all learning styles.